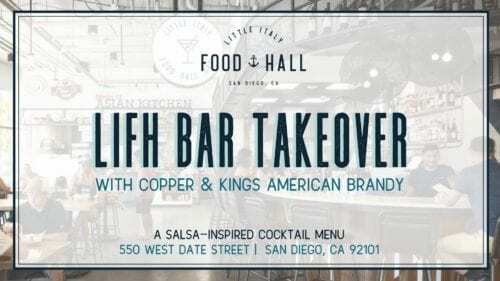 Join us at the Little Italy Food Hall Bar for a bar takeover with Copper & Kings American Brandy Company as they bring a Salsa-inspired cocktail menu. Check out one of five delicious cocktails to enjoy on the Piazza della Famiglia for Salsa Under the Stars on Wednesday, Feb. 27. Sit back and unwind to music from Manny Cepeda Orchestra 6-9PM as he brings his best repertoire of Classic Salsa, Merengue, Cumbia, Bachata and Cuban Music. COCKTAIL SPECIALS SERVED ALL DAY. MUSIC 6PM-9PM. Plus, it’s Wine Wednesday! 1/2 off all bottles all day for all of those wine lovers out there!